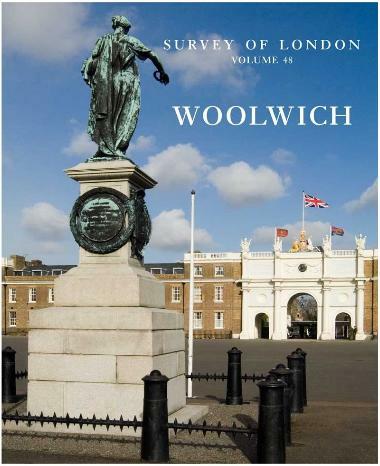 The launch of the Woolwich volume of English Heritage’s Survey of London will be marked by an exhibition at the Greenwich Heritage Centre and talks by Peter Guillery, Senior Historian at the Survey of London. The free exhibition starts tomorrow and runs until 9th February, and there is a talk at the Heritage Centre tomorrow at 2pm – you need to book by phone (020 8854 2452) or e-mail (heritage.centre@greenwich.gov.uk) – and also a Greenwich Industrial History Society talk at 7.30pm on 20th November at the Age Exchange Bakehouse. The book isn’t out yet, according to amazon it will be released on 26th November, but the draft version on the English Heritage website shows that it will be an essential source of detailed information for anyone interested in the history and development of the area. I’ve found lots of fascinating background information there already. The draft version doesn’t include any graphics, but we’re promised that the final version “will be a fully illustrated book, with around 100 new drawings, a similar number of new photographs, and altogether more than 400 illustrations.” My only (slight) disappointment is that it doesn’t quite cover Shooters Hill, just the parish of Woolwich (and that it’s an expensive book – maybe Woolwich Library will get a few copies). I’m looking forward to hearing how the historians researched the huge amount of detailed information in the Survey.